Yup, that he's better now than he was here? Waiting to see what the updated footballoutsiders take is after this week. Some of this is overreaction to an putrid game from almost everyone involved. Cousins is a good QB without a doubt. Having said that he was ranked 13th in DVOA according to FO. I would venture to guess that rose some with the last game against the Rams and Smiths will drop considerably. His fantasy football numbers are typically better than his advanced metrics. Yeah, lets discuss things that haven't been discussed for the past 9 months! I'll give you this giles, you're consistent if nothing else. I'd rather not change opinions every week. It's silly, but yet its like no one has ever watched the NFL before. Its about growth as a team. Learning from mistakes. Changing a losing culture. Gain some form of consistency in performance. Have we seen any real evidence of that here this season? This is YEAR 5 of the Allen/Gruden show. We seem to be making the same mistakes, albeit with a more talented squad in the main (mostly through recent drafts). In 2017 we were decimated with injuries, and off the street guys all over the starting 22, particualrly on offense. Does this really look any better? At this point (and as I said in my game summation this can change, its happened with other teams) have we really improved as a team, improved our performances? Right now I can't see it. THIS was my issue with getting smith. What's the point of paying all that money if its not gonna yield WINS??!! Also the complete underuse of Jordan Reed is mystifying. Nor can I. I see the same rollercoaster season as the past couple have been. So either our talent is over rated...or some/all of our coaches are not up to snuff. Or may be we just need that top 5 player at each position....or at least a majority of positions....to succeed. Agree on this 100%. Said so in the chat last night. Gruden goes to great lengths to get CT his touches....because good things can happen with CT touches the ball. Reed is like that. Why did it take so long to get him involved and, what, with a whopping 2 targets and 1 completion. And on the goal line we go to a pass to CT (getting him whacked in the process) instead of Reed. Our best players need to be more involved. And on more than just screen passes. So we are'nt using one of our best players who excels in the seams but are second last in the league in pass attempts over 20 yards. Dink and dunk passing game in the main. But I was also surprised to see NO on that least attempts list as well. 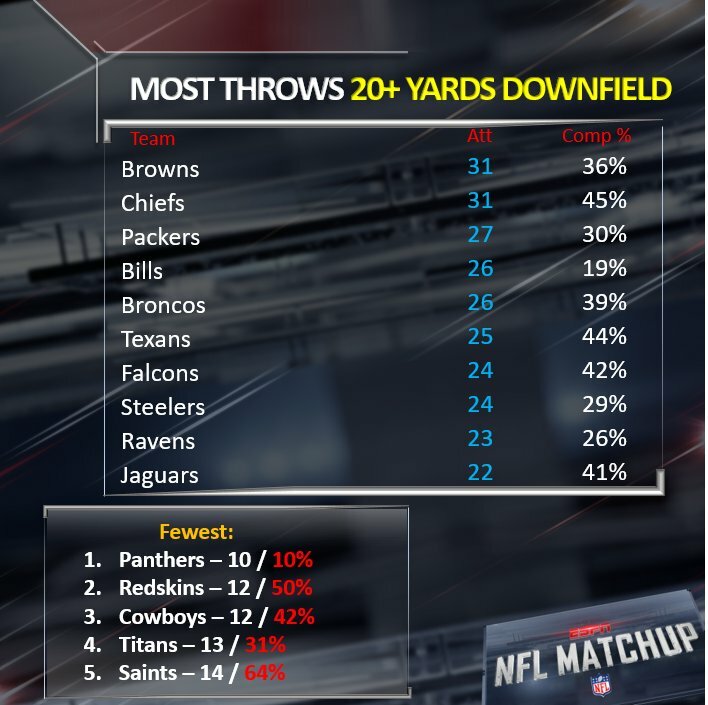 So according to PC's chart, we have the 3rd fewest 20+ yard attempts but the 2nd best completion %. Interesting. Side note, if not for the stupid QB hit rule, Cousins would be 1-3-1 as he threw the game losing INT (seen that before) against the Packers but was gifted a second chance. The Vikings defense is terrible this year. As now its ranked 21st overall and 23rd in scoring. So Minny's D struggles to stop anyone from moving the ball and scoring. And their running game is rubbish. One spot removed from dead last. Yup these are'nt the 2017 Vikings.......not yet anyway. Remember they were 2-2 last year with a better performing defense and Cook running over everyone, and looked in trouble after a horrible loss to the Lions in week 4. They then reeled off 8 wins in a row. Bro, the Eagles didn't lose to the Vikes because of one stupid roughing the passer call against Cousins. Is the hate really that strong for Kirkland?? Refs are a part of the game, but I guess bad calls are only 'bad' when they benefit KC. Trifling. I think you mean 2-3. Move on Stink. You know the score on your question mate. Cousins has played great, save for the Bills game. Well done, Kirk. Conversely, Smith has had 2 very poor outings. And the constant was falling behind early and our OL struggling in the running game. Without a running game, as you said all offseason, Alex is not nearly as effective. I still am hopeful about Alex but the offense needs young, physical, and nimble footed OL that can avoid the injury bug and not be manhandled either in pass pro or the running game. And our wideouts are deficient and don’t scare anyone, meaning we need major upgrades there this coming offseason. Cousins is playing quite well right now. Far better than our guy, who frankly looked like a washed up piece of ocean garbage yesterday. Cousins has also been the beneficiary of two egregious roughing calls, once of which certainly changed the outcome of the GB game and the other played a very large role in the outcome of the Eagles game. Those two things aren't mutually exclusive. Cousins is playing quite well right now. Far better than our guy, who frankly looked like a washed up piece of ocean garbage yesterday. Cousins benefited from a bad call against Clay Mathews. So what! The game didn’t end there. He still had to make plays to get that game into OT. Do those plays not count now because of the bad call. We’ll all remember specifically the Saints game last year. After our defense gave up a 15 point lead late,Cousins was driving us into field goal range with a chance to win the game. At the saints 35 Cousins gets called for a ridiculous intentional grounding call. So do the people who don’t want to give Cousins credit for leading the Vikings comeback against the Packers,want to give him credit for a win against New Orleans last year? Yeah,didn’t think so. Bad calls are part of the game. Through out his career cousins will have bad calls go against him and at times be the beneficiary of other bad calls. Just like every other quarterback in the league. I am talking about the Vikings vs. the Packers and the bogus penalty for roughing on a play in which Kirk threw an INT. Not sure what the Eagles have to do with anything. Cousins seemed to have a bit of panic and choke in him at times for the skins. But do I think he is performing better than Smith this season? Yes I do.